Here’s another look back at an older Suzuki GSX-R750 – one of our all-time favorite sportbikes for both the street and track. This review is from July 2007…it’s great to see how much technology has advanced in a decade. I had decided to ride the middleweight 2007 Suzuki GSX-R750 once again on the street to prove to myself that my first impression was correct: This machine is as close to the perfect sport bike as it is possible to get. Well, for now, anyway. creating a somewhat upright position with the hands merely dropped to reach the handlebars. Without a long stretch forward, the whole chin-up, neck-tweaking, shoulder-wrenching normalcy found on other supersports, was absent. The footpegs are naturally set somewhat high, but they do have some adjustability built in, and even with my long legs I still found the seating position to be comfortable. The engine is, of course, turbine-like. From idle, the motor reacts to throttle blips by spinning up and back down in an instant. An urgent yelping from the shorty exhaust placed under the engine (for improved weight distribution) gets the adrenaline surging immediately and then the light, cable-operated clutch bites at precisely the right point. Once underway I found the four-cylinder motor to have a visceral, slightly raw feel; and yet, thanks to a secondary balancer shaft, it neither buzzes unpleasantly nor creates the dreaded hand numbness of other machines I’ve ridden. Power is extreme, and yet very manageable; there’s no sudden big hit per se, just tons of power reaching the pavement right through the rev range. Carrying just 360 pounds plus rider and fluids, the bike’s lack of weight helps make it move extraordinarily quickly, especially if you scream the motor all the way to its 15,000 rpm red line. Although considerably more torquey than a 600cc machine, the engine does not produce the intimidating wallop of its big brother. 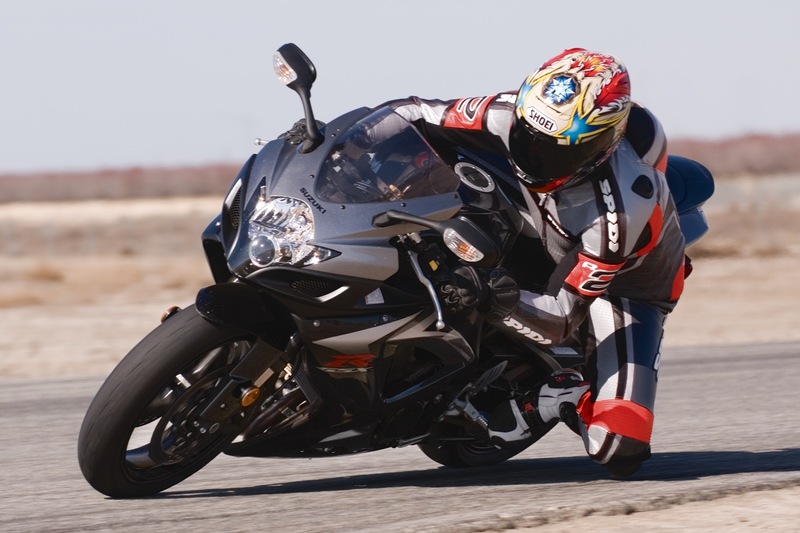 That is not to say the Suzuki GSX-R750 cannot high-side, but for this particular pilot, it is far less top-of-mind when exiting corners than on the hyper-horsepower bikes, and that makes for greater rider confidence and ultimately, more fun. Pulling out from slow speed corners in the lower gears, the two-stage fuel injection delivers plenty of torque and a genuinely smooth transition back on to the power thanks to Suzuki’s dual butterfly system (the first opened by the rider’s wrist, the second by the ECU) and twin multi-hole injectors. I remember it took them a while to get this right, but now this system has quite simply become my personal comparison benchmark. Accelerating through the local canyon sweepers of Malibu, the suspension is firm, without being either jarring or bouncy. Turn-in is absolutely precise, and the handling is perfectly neutral. With both high- and low-speed compression damping adjustment at the rear, the Showa shock is clearly sophisticated in both design and performance. I found no reason to tamper with any of the stock settings at either end of the machine, as the damping is clearly well-matched to the spring rate and preload. The Showa fork tubes have a carbonized titanium coating to reduce friction; interestingly the 750 received the 41mm tube diameter forks typically fitted to 600cc size machines rather than the larger 43mm found on the bigger bikes. Again this demonstrates Suzuki’s commitment to provide us with liter-bike power in a 600cc class chassis. The end result is a nimble, intuitive handling bike that turns quickly, precisely and with complete confidence in the front end. When getting particularly busy riding on the street, I came to appreciate the Suzuki’s cockpit display. The single, large, white faced tachometer is simple to read at a glance. Immediately to its right, the LCD speed readout is impossible to misunderstand. Between the two is a digital gear indicator; something Suzuki has stuck with since my GT750 water buffalo days back in the 1970s—and, yes, I admit I find it very useful.But, as we all know, it is one thing for a motorcycle to work well on the road, quite another for it to work well at the track. Surely a comfortable bike on the street would prove soft and vague at track speeds? Mark Duncan at The Track Club invited me to one of his well-run Buttonwillow Raceway Park events to find out. We dropped the excellent Bridgestone BT014 tires four psi from their street pressures to 30 front and 32 rear, and I then set off on a shakedown lap. Duncan recently pioneered running the track in a counter-clockwise direction. It makes for a smoother, more flowing layout, and includes a nearly seven-tenths-of-a-mile long straight, followed by a fast sweeping lefthander. Riding the track layout for the first time, I found myself preoccupied with figuring out which way the corners went rather than trying to further evaluate the bike. Interestingly, that experience encapsulated what is so impressive about this bike—the GSX-R750 behaved flawlessly and allowed me to focus on my riding, despite the unfamiliar track layout. A fan by the day’s end; clearly the middleweight Gixxer would have its mettle tested. Accelerating hard in second gear out of the slow Mazda hairpin, the Gixxer pulled seamlessly from around 4000 rpm. The six-speed gearbox has a nice short throw at the lever, and each gear selects smoothly. There is no missed shifting, no worrying, just the freedom to focus on the next corner that is now rushing alarmingly toward me. On that long straight I was seeing over 150 mph indicated before coming on to the brakes for the fast sweeper. Even the high speeds involved didn’t faze the Tokico radial calipers; there was no hint of fade and the radial master cylinder provided wonderful feel at the lever. Further on in the lap, screaming past the pits on the front straight led to a slow 90-degree righthander, and changing down through the gearbox into second gear was made seamless by the slipper clutch. Again, it was one less factor to be concerned about. Simple. And that is what I find so addicting about the Suzuki GSX-R750. It is the ability of the bike to fit so well, to perform so simply, so easily in every possible way, that the bike becomes one with the rider. Rather than think about the machine, or any aspect of what it is doing, I find my entire focus is on the ribbon of unraveling pavement ahead. Bravo, Suzuki.